One of two photos taken during a Westport Volunteer Fire Brigade exercise in 2006. They appear to show ghostly heads in the burning house. Another photo from the Westport fire. This photo of two students was taken at Linwood College in Christchurch and appears to show a ghost in between the two. 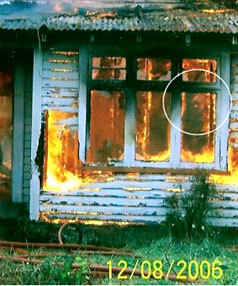 Are these some of New Zealand's spookiest pictures? For the past few weeks, The Press has been calling for New Zealand's best spectral images in the wake of a British competition that judged ghost pictures from around the world. The photograph chosen as the best by British judges was that of a ghostly figure, in Tudor dress, staring out of a ruined Scottish castle. The picture, taken in May last year, puzzled experts. The Press has received dozens of ghost shots from readers throughout New Zealand. Most were photos of ``orbs'' (largely explained by dust on the camera lens), strange patterns in smoke or odd reflections, but others were more difficult to fathom. Our judges picked four scenes. The first comprised two photos taken during a Westport Volunteer Fire Brigade exercise in 2006. They appear to show ghostly heads in the burning house. The second image is from a North Island pub and shows an indistinct feline-type face in the lower part of a window. 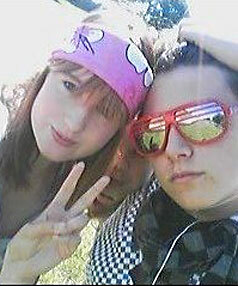 The third picture was taken at Linwood College in Christchurch. Who is that ghostly visage squeezed between the two students? The final scene was in Halswell, Christchurch, and the photo appears to show a grinning head discarded in a washing basket. New Zealand Paranormal Investigation Society director Brad Scott said most paranormal shots were easily explained. ``There are 90 per cent logical explanations for everything that occurs, but it's that 10 per cent that we look for,'' he said. Scott said he would probably get 200 photos sent to him every year. Many images could be explained by the tendency of people to find order in random patterns. ``If you see a face in the window, it could just be a reflection of light. There are very few paranormal pictures out there,'' he said. Of the dozens of orb shots The Press received, Scott said: ``I hate orbs with a passion because I know they're dust. There's nothing paranormal about a little flick of dust. ``If someone is saying a photo is paranormal it has to be taken with a grain of salt." "If you make these claims in public, you have to be able to back it up.'' Scott said the first photo from the Westport fire exercise was ``a pretty cool photo but it could be matrixing as well''. ``The flames could just be flames, even though I see a face,'' he said. Scott filmed the pub image. ``There's a face in the window at the pub. I didn't notice it until I was skipping through the DVD, so you just don't know,'' he said. James Gilberd, a paranormal investigator in Wellington, said of the Linwood College photo: ``We can't altogether write it off.'' Vicki Hyde, of the New Zealand Skeptics Society, said the photos could be easily explained. ``Shots involving fire, smoke and fog are notorious for producing ghost images,'' she said. ``These indistinct environments produce the kind of patterns we try to resolve as meaningful, and the most meaningful pattern we know is the human form. She said the pub shot `` looks to be a reflection of objects inside the room''. ``The human brain is highly prone to see faces in any patterns the strongest thing a human will react to from the moment of their birth,'' she said. She believed the Linwood College shot could easily have been someone behind the pair trying to get in shot. 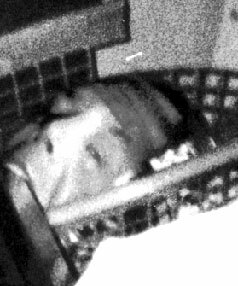 The picture of the head in the basket was taken in early 1996 in Halswell, and has an earthly explanation. Carol McDonald took a photo of her 10-month-old grandson, but in a basket in the background there seemed to be a head. The family was terrified until it was emerged the head was a picture of actor Jack Nicholson, star of horror film The Shining, from a Skywatch magazine that had been dropped in the basket. If you have any ghost photos or spooky Christchurch tales, send them to keith.lynch@press.co.nz. I don't think there can be a third actual person there, as you can clearly see grass below the apparant face. I think it is a case of pareidolia, or matrixing, but we can't be absolutely certain. I agree with Brad's opinion that the face in the flames is probably also matrixing. Great article though Keith. Hope this prompts a further response and unearths some more intriguing ghostly photos. 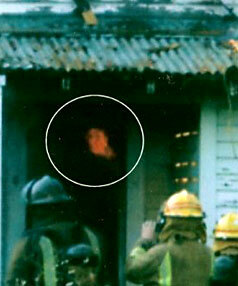 The first fire brigade picture not only shows a ghostly figure at right, but also has two small children reaching out to each other in the centre skylight window. excellent write up! but would be good to see the pub photo mentioned in the artice. Do you support performance pay for teachers? Send us your photos, videos and tip-offs.